Check to see if the bolt is rotating into full battery. If not that could be causing your problem. If there is any damage to the bolt lugs or mating surfaces of the receiver or operating slide it could be binding. Also, damage to the rear of the bolt could prevent the hammer from properly striking the firing pin. There are a number of other possible causes but we should rule these out first. +1 to everything Jack said. Also try soaking the firing pin and bolt assembly in Hoppes #9......... It might just be gunked up, killing the force of the firing pins hit on the primer. Sure sounds like it's not going into battery. All of what these guys said, but check your most recent fired brass for solid primer strikes. If they seem lighter than what you're accustomed to, could be the head-space has slipped out of tolerance, or the hammer spring is simply weakened over time, but not likely. Let's hope it's not head-space. Disassemble/inspect/clean the bolt and internals, make sure everything moves as it should. check the nose of the FP for chips or damage. Make sure the bolt fully rotates and locks. Try different ammo. If the action is tight...maybe the ammo could be long causing it not to close/rotate. "Suddenly" usually indicates something is broken or stuck. If you've fired that ammo routinely, it's likely not the cause. I have had similar issues B4 and in one case, the nose of the FP was only slightly chipped and deformed...enough to cause failure-to-fire. there was a thread that had a similar issue. turns out the extractor was cracked. Check extractor and ejector movement to make sure not binding or damaged. Basically as stated above, if the bolt does not rotate fully the receiver has a bridge that prevents the firing pin from going forward. I have an inland that would fire 2-5 rounds then misfire without denting the primer. Turns out it's most likely the extractor rim not slipping over the cartridge's rim, thus not fully seating the bolt into battery. 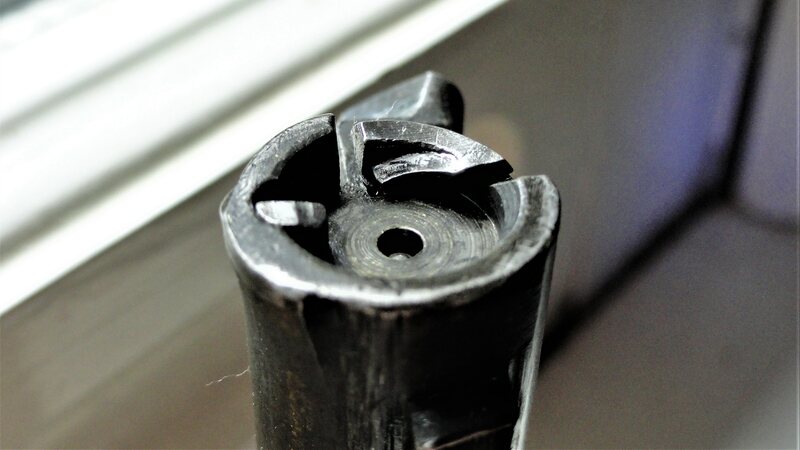 If the extractor is free from damage, your extractor spring and plunger might not be snapping open freely enough due to either improper assembly of that region, or there is dirt/grime impeding the free travel of spring/plunger. Check the spacer which fits alongside your M2 hammer. It must be thick enough to preclude any lateral shift of your M2 hammer. If hammer moves sideways even a little bit, it won't hit the firing pin. Such a change from functioning to non-functioning could be sudden, as observed. I completely overlooked OP remarks about a “foreign” firing pin. Where did the possibility of a spacer crop-up?